Filmfare is an English-language, tabloid-sized magazine about Hindi-language cinema, popularly known as Bollywood. Established in 1952, the magazine is published by Worldwide Media, a subsidiary of The Times Group, India's largest media services conglomerate. Filmfare is one of the most popular entertainment magazine in India. Since 1954, it gives popular film awards the annual Filmfare Awards, Filmfare Awards South and Filmfare Awards East. Shah Rukh Khan, also known by the initialism SRK, is an Indian actor, film producer, and television personality. Referred to in the media as the "Badshah of Bollywood", "King of Bollywood" and "King Khan", he has appeared in more than 80 Bollywood films, and earned numerous accolades, including 14 Filmfare Awards. For his contributions to film, the Government of India honoured him with the Padma Shri, and the Government of France awarded him both the Ordre des Arts et des Lettres and the Légion d'honneur. Khan has a significant following in Asia and the Indian diaspora worldwide. In terms of audience size and income, he has been described as one of the most successful film stars in the world. Shammi Kapoor was an Indian film actor and director. He was a prominent lead actor in Hindi cinema from the Mid 1950s until the early 1970s and also made a debut in Tamil cinema with the 1992 blockbuster crime drama Amaran. He received the Filmfare Best Actor Award in 1968 for his performance in Brahmachari and Filmfare Award for Best Supporting Actor for Vidhaata in 1982. Raaj Kumar, born as Kulbhushan Pandit, was an Indian film actor. He worked as sub-inspector of Mumbai Police in the late 1940s before he turned to acting with the 1952 Hindi film Rangeeli. He appeared in the Oscar-nominated 1957 film Mother India and went on to star in over 70 Hindi films in a career that spanned over four decades. Kaajal is a 1965 Bollywood film produced by Pannalal Maheshwari and directed by Ram Maheshwari. The film stars Meena Kumari, Dharmendra, Raaj Kumar, Padmini, Helen, Durga Khote, Tun Tun, Mehmood and Mumtaz. The films music is by Ravi. Aashirwad is a 1968 Bollywood film, directed by Hrishikesh Mukherjee. The film stars Ashok Kumar and Sanjeev Kumar. The film is notable for its inclusion of a rap-like song performed by Ashok Kumar, "Rail Gaadi". Shahid Kapoor, is an Indian actor who appears in Hindi films. Cited in the media as one of the most attractive Indian celebrities, Kapoor maintains his popularity despite a fluctuating career trajectory and is the recipient of several awards, including three Filmfare Awards. Initially recognised for portraying romantic roles, he has since taken on parts in action films and thrillers. 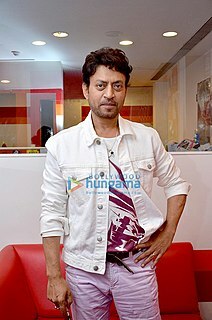 Irfan Yaseen Khan, also credited as simply Irrfan, is an Indian film actor, known for his work predominantly in Hindi cinema, as well as his works in British films and Hollywood. 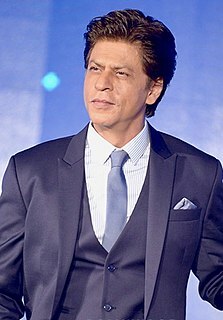 In a film career spanning almost thirty years and featuring in more than fifty domestic films, Khan has received numerous awards, including a National Film Award and Filmfare Awards in four categories. Film critics, contemporaries and other experts consider him to be one of the finest actors in Indian cinema for his versatile and natural acting. In 2011, he was awarded the Padma Shri, India's fourth highest civilian honour for his contribution to the field of arts. Ranveer Singh Bhavnani is an Indian actor who appears in Hindi films. The recipient of several awards, including three Filmfare Awards, Singh is among the highest-paid actors in the country and has featured in Forbes India's Celebrity 100 list since 2012. Bobby is a 1973 Indian Bollywood musical romance film, directed by Raj Kapoor and written by Khwaja Ahmad Abbas. It was the first leading role for Raj Kapoor's son, Rishi Kapoor, and the film debut for Dimple Kapadia. Saaransh is a 1984 Indian Hindi drama film directed by Mahesh Bhatt, starring Anupam Kher, Rohini Hattangadi, Madan Jain, Nilu Phule, Suhas Bhalekar and Soni Razdan. It is about an elderly Maharashtrian couple living in Mumbai who come to terms with the loss of their only son. This was the screen debut of Anupam Kher. The film had music by Ajit Verman and lyrics by Vasant Dev. It was distributed by Rajshri Productions. Kaho Naa...Pyaar Hai is a 2000 Indian romantic drama-thriller film, written and directed by Rakesh Roshan. It marks the debuts of his son Hrithik Roshan and Ameesha Patel. The film featured Hrithik in a double role as characters Rohit and Raj. The 39th Filmfare Awards were held in 1994. Film Baazigar dominated the night. Mahesh Bhatt's Hum Hain Rahi Pyaar Ke was named the best film of the year. Shah Rukh Khan won his first Best Actor award for his role in Baazigar. He also won the critics' award for Kabhi Haan Kabhi Naa and was nominated as Best Villain for his role in Yash Chopra's Darr, rounding off a spectacular year for him, while Juhi Chawla went on to win her first Filmfare Award for Best Actress. The 38th Filmfare Awards were held in 1993. Mansoor Khan's Jo Jeeta Wohi Sikandar was adjudged Best Film without winning any other major awards. The films Beta starring Madhuri Dixit and Anil Kapoor, and Deewana starring Rishi Kapoor, Divya Bharti and Shah Rukh Khan received the most number of awards that year. The 37th Filmfare Awards were held in 1992. Yash Chopra's Lamhe was declared the Best Film of the year. Sridevi received the Best Actress award while Amitabh Bachchan won the Best Actor award. The 30th Filmfare Awards were held on 25 September 1983. Ramesh Sippy's Shakti won the Best Film Award, which starred Dilip Kumar and Amitabh Bachchan, playing father and son. Dilip Kumar won the Best Actor Award for a record 8th time.